Everything at campsite Poljana is perfectly organised and the staff is always ready to help. The location is beautiful. Real camping, under canvas, but with almost all comforts of home! The SunLodge Bintulu easily meets the highest needs of glampers. Our newest accommodation has two bedrooms (suitable for 5 people) and a spacious bathroom. It’s the largest lodge tent in our range! In the spacious living room there’s a comfortable (pull-out) sofa and the kitchen is equipped with a dishwasher. Everything for a relaxing holiday. The Bintulu is completely and stylishly decorated. With a large covered veranda. 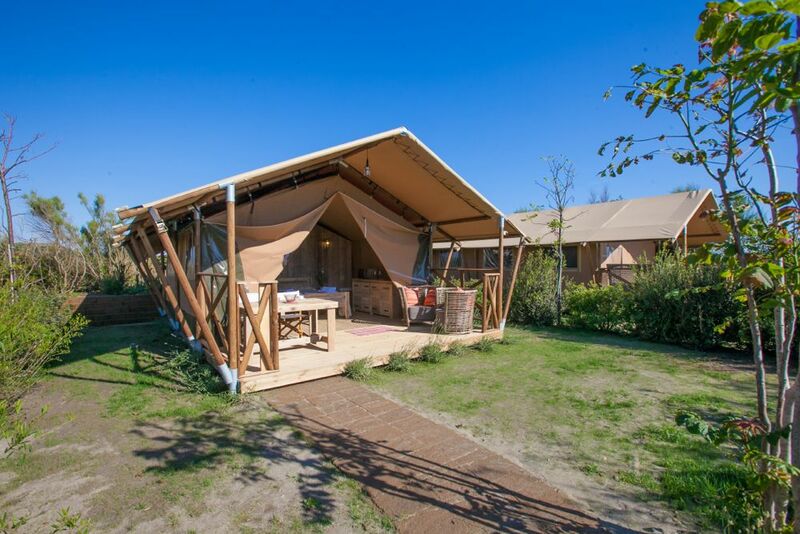 The SunLodge Bintulu is located at specially selected campsites in Italy and Croatia. Places which are just as special as the accommodation itself, and great places to be in the early and late low seasons also. * Reality may deviate somewhat from the information given. From £ 230 a week! A lovely place for cooking and sitting. Large beds and thick mattresses for a good night’s sleep. Unusually for a tent, there is a shower and toilet. You could sit there all day! ** Air conditioning is only present in Bintulu tents on Campsite Tenuta Primero. You do not pay an extra fee for this. There is no air conditioning on other campsites. All descriptions and pictures are provisional. Reality may deviate somewhat from the information given. Ideal for large or combined families; there is space for 8 people! Embark on an adventure with your children in the SunLodge Jungle, suitable for 5 people.